Since 1971, MKCCC has been serving families and children with its inventive, cutting edge, and comprehensive day care programs. Today, over 30 years later, we continue to promote each child’s intellectual, physical and social development. Mount Kisco Child Care Center, 95 Radio Circle, Mt Kisco, NY 10549, www.mkccc.org, djordan@mkccc.org, 914 241 2135. Now celebrating its 20th year, Music in Chappaqua customizes its music curriculum according to how each student wishes to develop. From beginner – career bound, toddler – adult, classes are offered in piano (jazz, pop, rock, classical), voice, violin, viola, cello, bass, flute, saxophone, clarinet and trumpet. Rock instruction includes keyboards, guitar, bass, drums and vocals. Rock workshops are also available that culminate in a live rock concert in a New York City rock club. Open 7 days a week, after school and evenings. 220 North Greeley Avenue, Chappaqua. Please call (914) 238-3123, email at mail@musicincchappaqua.com or visit us www.musicinchappaqua.com and www.facebook.com/musicinchappaqua. Music should be fun AND educational! Children should always look forward to their music lessons and with my uniquely adaptive approach, they will! I am a classically-trained performer with a background in music therapy who teaches private piano, voice, guitar, and flute lessons to children ages 4+. Utilizing a different approach to music instruction, students are able to learn proper technique while keeping lessons fresh and interactive. Will travel to your home or I have a studio in Northern Westchester. References available. 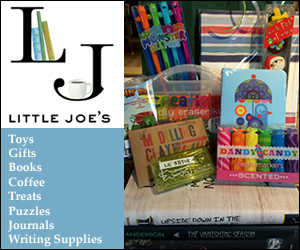 Contact me for a free consultation and to explore your child’s creative side! amymarierood.com/AmyMarieRood.com/private_lessons.html AmyRoodMiller@gmail.com, (917) 940-9407.
, *11 Year old players can choose-Division 2 is more advanced* Click here for more information. Always wanted to learn how to play? 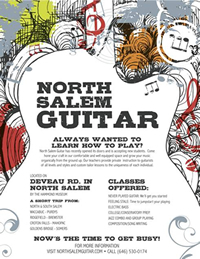 North Salem Guitar has recently opened its doors and is accepting new students. Come hone your craft in our comfortable and well equipped space and grow your music organically from the ground up. Our teachers provide private instruction to guitarists of all levels and styles and custom tailor lessons to the uniqueness of each individual. Located on Deveau Rd in North Salem (by the Hammond Museum). For more information, visit www.northsalemguitar.com, or call (646)530-0174. Learn, practice & improve your singing in this small group (5 person max) singing class instructed be experienced proffessional vocalist, record engineer and coach to Americal Idol & The Voice finalist. Learn breathing, pitch, range,vibrato and how to sing your favorite songs. Fun six week class is offered every month. Eve Soto 914 659 9876. For more info/register click here.